Inexpensive replicas of Dimetrodon, the so-called "sail-fin reptile" or "finback reptile," are very eye-catching because they show the fin supported by elongated spines projecting from along the backbone. In terms of the skull and teeth of Dimetrodon, however, these replicas, are commonly not morphologically accurate, and this post will attempt to shed some light on these subjects. Dimetrodon lived during the Early Permian, approximately 295 to 275 million years ago. Most specimens have been found in red beds in Texas and Oklahoma. At least a dozen or so species have been described. Dimetrodon was a carnivore that had a maximum body length of approximately 2 to 5 m (5 to 15 ft.) and a maximum weight of 250 kg (500 lbs). Its fin was used for thermal regulation and certainly not for "sailing." In earlier (outdated) classification systems, Dimetrodon would have been called a "pelycosaur" or a "mammal-like reptile." Dimetrodon is now classified as a synapsid mammal because it has a temporal opening, located relatively low on the back of each side of the skull. Synapsids show remarkable transitions from reptile-like to dog-like forms, and Dimetrodon was an early synapsid that had reptilian-like features. The side view of a skull of Dimetrodon shown below is morphologically correct. The temporal opening (also called the infratemporal fenestra), which was used to accommodate bulging jaw muscles, is an important evolutionary feature used to link Dimetrodon with mammals. Notice that the size of the teeth of Dimetrodon differ considerably. Also there are several teeth at the opening of the mouth that are located higher (i.e, the maxillary step) than are the other teeth. The name "Dimetrodon" means "two shapes of teeth." Its teeth show some differentiation, and this is a mammalian trait. Side (lateral) view of a replica of a Dimetrodon skull, length 16 inches, height 10.5 inches. The ventral view, shown below, of the lower jaw clearly shows how the tooth size varies and how the teeth at the front of the jaw are constricted. The red arrow points to a row of throat teeth (pharyngeal teeth), which were used to pin struggling prey. Dorsal view of the interior of the lower jaw of the same replica. 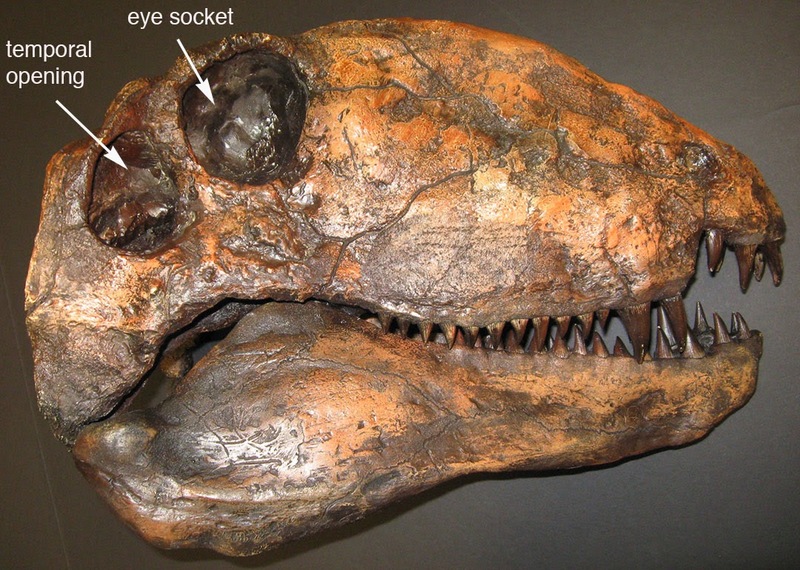 The last picture (see below) shows the top view of the skull, which is solid (i.e., no openings) and unlike the skulls of dinosaurs. In a future post, I shall illustrate how a dinosaur skull differs from that of synapsids, like Dimetrodon. Top (dorsal) view of the replica of the skull of Dimetrodon. I appreciate your thought that children can easily learn and get more knowledge on the Animatronic Dimetrodon. Is that a solid palate to the mouth cavity without nostril openings? A mammal trait for suckling milk.